"The Upside" currently has a rating of 39% on Rotten Tomatoes. Some people feel an original movie will always be better than the remake. In the case of “The Upside” and “The Intouchables,” I am not sure which one is better. The only real difference between the two is what each set of actors brought to the table. 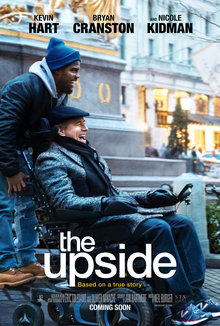 “The Upside,” based on a true story and a remake of the the 2012 French film “The Intouchables” focuses on a parolee named Dell (Kevin Hart) who just got out of prison and is forced to look for a new job. Dell is not very interested in finding a job, but one falls into his lap. He walks into an apartment building on Park Ave. in New York City for a janitorial job, but ends up getting sent to the penthouse by mistake. There Dell finds Phillip (Bryan Cranston), a billionaire who was paralyzed after a paragliding accident. Dell quickly finds out that this is not an interview for a janitorial job, but one as Phillip’s new caretaker. Phillip defiantly chooses Dell (even though he was the least qualified applicant) against the clear wishes of Yvonne (Nicole Kidman,) who handles his business affairs. Dell is unconvinced until he is made aware of the salary, which he needs to pay child support. As the film plays out, the plot becomes increasingly predictable. The only thing that was really surprising was Hart’s performance. Viewers are used to Hart’s past films where his comedic presence is often over the top. But, while he had his comedic moments, his role in “The Upside” was a little more serious. His performance was more focused on the relationship between his and Cranston’s characters. While the film was centered around the pair’s friendship, it does not reach beyond surface level. The pair only shares a few “deep” conversations and the relationship was pretty predictable. From the high to the low moments, the viewer’s can see each one coming. Rather than wrapping up the film with a smooth ending, it ended rather abruptly. The audience could feel that the end was coming, but it was never really a clear cut ending until the credits began to roll. It was a little confusing, and over all unsettling. Overall, the movie was not awful by any means. 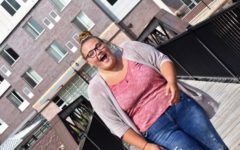 It was humorous and light-hearted with a few serious scenes mixed in. Each actor’s performances were the best aspects of the film. It was refreshing to see Hart step away from his notorious wild persona and into a role that was a little more down-to-earth. I recommend this movie to anyone who is looking for a good laugh. It is interesting to see the friendship grow between Dell and Phillip, and there were many times throughout the film when the two had the whole theater laughing. Overall, I think “The Upside” deserves a 7 out of 10.